Re: What-If 0058: "Orbital Speed"
gmalivuk wrote: If you're sticking to optimal paths, a completely straight "spiral" only happens in the limit as acceleration approaches infinity. And since infinite acceleration is hardly optimal for any potential passengers, I'd say not even then. Seems obvious enough. What about some middle ground, say achieving escape velocity by 360 degrees? CityZen wrote: Let's forget satellites and orbiting for a moment. What if we just want to leave Earth as quickly as possible and head out of the solar system? Do you still want to orbit first, then achieve escape velocity before leaving earth? Or would you do just as well to aim "straight up"? and approaching a planet by going "straight down". What's wrong with this picture? then you are fighting against gravity the whole time that you are accelerating. speed puts you into higher orbit until you achieve escape velocity. the more you can "unwind" this spiral trajectory into a straighter path. to completely straighten out the spiral? If you're talking from the earth's surface, it's a trade off. Straight up puts you through much less atmosphere, straight sideways eliminates (almost) any thrust required to fight gravity. If you're talking from orbit, then accelerating "straight up" is perpendicular to your existing velocity, and you're better off accelerating along it. Yeah, accelerating perpendicular to your velocity doesn't change your orbital energy at all, it just changes the shape and/or orientation of your orbit. This can of course be quite useful if that's what you want to do, but if you want to move from LEO to a higher orbit, then at some point you have to have some thrust in the direction of motion. If the Earth were not rotating, and you goal was to get to escape velocity as soon as possible, then going straight up would be the way to go. In genreral you want to thrust in the direction of your motion. If the earth were not rotating you could be thought of as at the top of a vertical orbit through the center of the Earth with semimajor axis the diameter of the Earth. Once you start your engines you are no longer relying on the support of the planet and you might as well have been on this orbit. So if the planet were rotating you would want to thrust in the same direction as your hypothetical orbit so that would be horizontal, since at the apogee of this hypothetical orbit you would only have tangential velocity. The problem is that unles you were at the peak of a very high mountain and you had a tremondous amount of thrust, this would result in you crashing into the ground. So basically, you need to thrust as close as possible to this direction, that is, use as little of your thrust as possible to stay up, and the rest to accelerate horizontally (in the direction of your orbit. This is basically what we currently do to get to orbit. The question is which waste is greater, the waste of your tangential momentum that occurs in a radial flight path, or the waste of acceleration that occurs in the tangential flight path. Given that we usually are aiming for earth orbit not earth escape with rocket launches, we need that tangential velocity anyway, so the standard up to get out of atmosphere and then sideways flight path. I don't know what they do on Earth escape missions. It seems reasonable to me that if you were aiming for Earth escape a radial launch path could be best. East takes you out, out takes you west, west takes you in, in takes you east. Nicias wrote: If the Earth were not rotating, and you goal was to get to escape velocity as soon as possible, then going straight up would be the way to go. The question is which waste is greater, the waste of your tangential momentum that occurs in a radial flight path, or the waste of acceleration that occurs in the tangential fighting flight path. Given that we usually are aiming for earth orbit not earth escape with rocket launches, we need that tangential velocity anyway, so the standard up to get out of atmosphere and then sideways flight path. No, vertical thrust is only useful to get out of the atmosphere. But it's the worst possible direction for when you have gravity drag. On an Earth with no atmosphere, thrusting at 3g upward wastes fully 1/3 of your thrust fighting gravity, while thrusting at an angle can reduce the waste to less than 6%. To escape, it doesn't actually matter what direction you're moving (so long as you won't crash into the central body). If you're moving at escape velocity for your distance, your orbit will escape. Ah, I see my mistake. I didn't want to waste thrust perpendicular to my orbit, and I considered a stationary object on the surface to be at the apogee of a radial orbit. At this point the velocity of the rocket is zero so its direction is not defined. Thus any thrust is actually wasted. The most effecient thing to do is to wait a moment until it has a direction and then thrust in that direction. Hence you want to thrust downward. Actually, a given deltaV is most effective when applied at perigee. Thus you should let your rocket fall to the center of the earth and then thrust as you pass through the center. Of course, all of this assumes a non-rotating insubstantial Earth. The rotation part doesn't change much, you should still fall and thrust at perigee. So all we have to do is plot the path of our rocket under this hypothetical path: An elliptical path to pergiee in the core somewhere, blending to a hyperbolic path out, all twisted by the rotation of the earth as our flight progresses. Then we dig this tunnel out, line it and remove all the air. Then we will have no gravity losses. Drop our rocket into the hole, let it thrust at perigee and it comes launching out the other end at escape velocity or more. You want to actually thrust whatever amount you need to with the centerpoint, timewise, of the thrust at the center of the earth. If you just dropped it in, you'd stop at the same altitude on the other side of the earth. This is ignoring the fact that if we can dig a hole straight through the earth and line it and all of that we prrooooobbably don't have any problems getting into space. The path wouldn't pass through the center, because you start out with a fair bit of speed from Earth's rotation. Also, it wouldn't be an ellipse, because as you fall through the Earth the gravity pulling you farther down decreases to nothing at the center. I hadn't thought of the rotational speed, good catch. I'm surprised nobody has linked to this page yet, though. It lists several methods of getting to orbit, including a brief mention of a "Bifrost Bridge" -but from what I can tell it appears to only be a laser-assisted system, with some other method (mass driver?) imparting the initial velocity. My personal favorite though is the Verne Gun. Forget Space Elevators, this method gets more mass into orbit in single launch than one of those gets up in a century! Possibly more than has ever been sent to space before IN TOTAL. 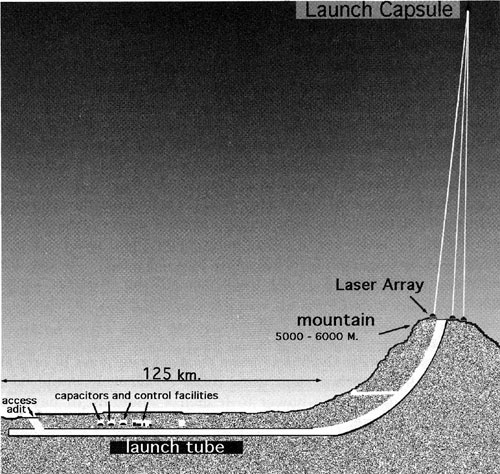 The idea is pretty simple: detonate a nuke in a salt dome (as we have been doing for decades) to launch an Orion-like projectile directly into orbit. Of course you couldn't possibly launch anything as fragile as a human this way, but just imagine what NASA could do with 280,000,000 kg of bulk water, aluminum, rocket fuel, components, or whatever they want in orbit. "Hey guys, scratch the four-man Mars mission: let's go ahead and send forty!" Most of the fallout is naturally contained by thousands of meters of earth, and I'm sure we could find a way to mitigate the rest. We get to put dangerous WMDs to productive use. And best of all, it's plausibly doable with modern technology: unlike space elevators, we don't have to rely on some unknown supertensile material. gmalivuk wrote: Did you see the speed in m/s and think it meant mph? Don't worry; didn't that happen to NASA once? keithl wrote: As a rule of thumb, it is imprudent to pass over speed bumps faster than orbital velocity. gmalivuk wrote: The path wouldn't pass through the center, because you start out with a fair bit of speed from Earth's rotation. Also, it wouldn't be an ellipse, because as you fall through the Earth the gravity pulling you farther down decreases to nothing at the center. This got me wondering what shape the orbit would be. So I started digging into the "Central Force Problem." Since, assuming a homogenous earth, we have to replace the F(r) = -1/r^2 gravity law with F(r) = -r. Most source I could find stopped after determining that the orbit is the solution to some differential equation. Then I found this pdf where they solve for just such orbits. Check this out. They are still ellipses. Just with the center of the earth at the center of the ellipse, not at a focus. So your paths, while inside the tunnel, would be two arcs of ellipses. The outgoing one would have a larger semimajor axis but still be an ellipse since there are no unbound orbits under a F(r) = -r force. Of course the actual tunnels wouldn't be ellipses because your path in the rotating frame of the earth wouldn't be an ellipse. Also once you got out of the tunnel your path would become a hyberbola since then gravity would be inverse square again. See figure 6 on page 14 of the link. Really, if we can get the air-equivalent of a cavitation torpedo working, to allow low-drag hypersonic flight (which itself is no mean feat, but far easier than these problems and lots of research has been done), then LEO becomes a lot closer. You know how a cavitation torpedo works? It vaporizes the water in front of itself at it travels (using ultrasonics, I imagine), and flies though the air pocket it creates. This takes a lot of energy, but even so vastly less energy than actually moving through water at 300 knots. The same thing can work in air - you convert the air to plasma in front of you, move the plasma out of the way via magnetic steering (steering the plasma, not the rocket), and fly through vacuum with no air resistance. This takes a lot of energy, but past some speed it takes less energy than you would otherwise lose to drag. Lots of money has been spent trying to make this work (it has significant military application). One of the obstacles is that radio communication with something flying along in a plasma bubble is really hard (though not impossible). When this technology becomes practical it will make the ground-to-LEO step much easier: less lost to drag, less to worry about maximum dynamic loading, friction heating of exposed surfaces, and so on. It's neat. That sounds like 9,001 kinds of epic. Is it possible to design a supercavitation/plasmacavitation vehicle such that air pressure pushes you into the vacuum pocket, further reducing energy costs? Supercavitation is caused by a reduction in pressure causing the liquid to "boil". This isn't possible if your fluid is already a gas. Red Hal wrote: Supercavitation is caused by a reduction in pressure causing the liquid to "boil". This isn't possible if your fluid is already a gas. The gaseous analogy would be the creation of plasma and the subsequent vacation of that plasma using a magnetic field....unfortunately, reduction in pressure doesn't cause gas to ionize, so it would take a good deal more energy. Also, wouldn't the magnetic field impart force onto the ship? The magnetic fields *would* impart force on the ship, however, as a net force, it would be negligible - the only way the magnet could affect the ship is by damaging components - by magnetic fields or by shear force - or by the negligible forces the field exerts by reaction with the earth's field... which might become not-so-negligible when you consider how strong it would have to be to push the ionised gases out of the way. I'm not expert, though, so this is armchair-level. Ralith The Third wrote: The magnetic fields *would* impart force on the ship, however, as a net force, it would be negligible - the only way the magnet could affect the ship is by damaging components - by magnetic fields or by shear force - or by the negligible forces the field exerts by reaction with the earth's field... which might become not-so-negligible when you consider how strong it would have to be to push the ionised gases out of the way. I'm not expert, though, so this is armchair-level. I was thinking that the force of pushing the ionized gases out of the way would be placed equal-and-opposite on whatever was controlling the magnetic field and thus doing the pushing. Ahh, right. Don't know why I didn't think of that. I imagine the losses to that would be negligible compared to the losses to drag, though I'm far from certain. Better minds - and supercomputers - than I are on the task. Ralith The Third wrote: Ahh, right. Don't know why I didn't think of that. Basically, we'd be looking at a cone-shaped magnetic field surrounding the front of the craft. Like any wedge, the force of pushing the medium in a perpendicular direction is imparted in a backward direction on the pusher. There will always be a "drag force" equal or greater to the force required to push the air out of the way. The advantage is that the magnetic field imparts this force to the plasma via a perfectly inelastic collision. Thus, while force is still being imparted to the air to push it out of the way (which will compress it, among other things), there is no frictional force adding to the loss. Of course, the fact that you have to ionize the air to begin with....well, that's problematic. Could there be an orientation/design whereby the added heat from the compression of the plasma being pushed toward either side would subsequently go into the heating and ionization of the air in front? Cavitation from liquid to gas produces nice little shockwaves when the bubble collapses. The collapse of a vaccum does the same thing. Is there any way to use the continual shockwave formed by the collapse of the vacuum behind the ship to push it forward, thus decreasing the energy requirements? Otherwise that shockwave is just wasted. One could ultimately conceive of an "inside-out arcjet/plasma thruster" that ionizes air in a cone around the front of the ship, accelerates the plasma around its body using magnetic fields (thus removing drag entirely), then allows the vacuum-plasma envelope to explosively collapse in such a way as to produce a wave that it could gain impulse from. Thus drag would be entirely negated and the working mass would be the atmosphere itself. this would seem relevant. Sorry for Thread necro. Back in November, Elon Musk cited this very what-if from his Twitter. It was after Amazon's CEO Jeff Bezos successfully pulled off a suborbital spaceflight with a tail-first landing of the booster stage. "Blue Origin took its first stage up to the Karman line and landed it under power with legs. In other news, Elon allegedly turned red in the face and let out a steam whistle when he received the news." "This is awesome BUT I wouldn't turn red. They went up but there was no sideways action. It's all about the sideways." Speaking of Elon Musk, what if you combined a scace elevator with a hyperloop? You'd have a very expensive crash. HES wrote: Speaking of Elon Musk, what if you combined a scace elevator with a hyperloop? Perhaps you're thinking of a launch loop or an orbital ring? It would be a Hyperspace Loop? ijuin wrote: It's a big enough difference that any small object sharing the Moon's orbit but outside of the Moon's gravitational influence (and not at the L3, L4, or L5 points) will eventually have the Moon overtake it, at which point it will either collide with the Moon, be catapulted into a different orbit, or (rarely) be pulled into lunar orbit. In other words, it is NOT a stable orbit for satellites, aside from the aforementioned L-points. Actually, unless something very, very strange happens, it will never get captured by the Moon. You need a minimum of two impulses to enter an orbit.